Heat Resistance: Bending after heat treatment at 550 Deg. Cel. 308-111: 1/8 – 1/4 in. 308-112: ¼ – ½ in. 308-113: ¾ – 1 in. We are supplying high quality Fiber Glass Sleeves. These are silicon rubber coated fiber glass varnished sleeves, which are suitable for lead insulation and electrical connections. Our product comprises immense durability and can survive even in the extreme situations of high amount of heat and temperature. We supply Fiberglass Sleevings that possess good qualities of dielectric, excellent softness and high temperature. 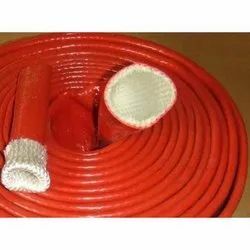 These are braided with non-alkali fiber glass yarn that is treated with high temperature and then coated with silicon varnish. 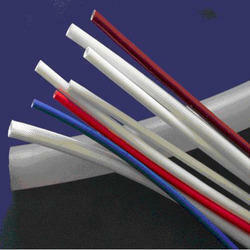 We have established ourselves as coveted organization, involved in offering PVC Fiberglass Sleeves.